This month has brought some much needed sunshine and only a week later, snow. Yes, snow! One thing that always cheers me up and will keep my mind off the snow, is my monthly arrivals of my beauty subscription boxes. 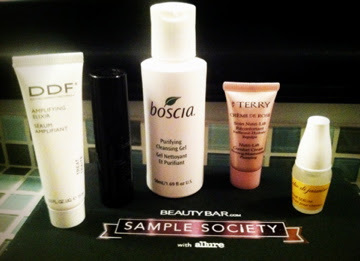 First to arrive this month, was my Sample Society April box. This is Sample Society's second official box, their debut was in March. It's a team up of Allure magazine and BeatyBar.com sending 5 deluxe beauty samples, a mini tip book, and a coupon code for purchases at www.beautybar.com . Overall, I really love the size of the samples they include. However, I am really hoping next month they might include a few more makeup products that they've lacked in the first two boxes. Maybe a lip or cheek color sample. 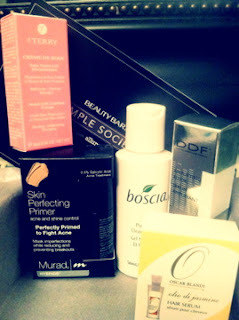 Too many skin care samples and your skin may go berserk if you're trying them all. i may check into this because i love allure!